Are there significant changes in flint mining techniques between prehistoric and Indus flint knappers? Yes, mining technique vary according to the different periods of prehistory, from the Middle Palaeolithic onwards. During the Acheulian Early Palaeolithic they simply collected large chert boulders from the surface of a few very speficic areas, like Ziarat pir Shaban, for instance; during the Late (or Upper) Palaeolithic they did some kind of extractive work as shown also by the systematic recurrence of bifacial chert picks; and during teh Bronze Age Indus Civilization they opened real open-air mines to extract chert nodules from a depth of ca 1 m. As farv as we know they never went deeper into the harder limestone deposit. Flint (or chert) mining techniques probably didn't change dramatically between the prehistoric and Indus period. At numerous locations across northwestern South Asia, nodules of flint/chert can be found on or near the ground surface, eroded from the geologic formations in which they occur. During the prehistoric period, there was likely ample raw material that could be had without mining. During the Harappan Period, when the production of flint/chert tools occurred on an industrial scale at places like the Rohri Hills of Sindh, shallow pits were excavated in order to expose the fresh nodules below the ground surface. Although there are thousands of such pits, none seem to have gone deeper than a few meters. The large flint nodules used for making stone tools are found eroding from the tops and sides of the Rohri Hills. There is not much need for mining and there is no indication that prehistoric and Indus flint workers developed different techniques of flint mining. 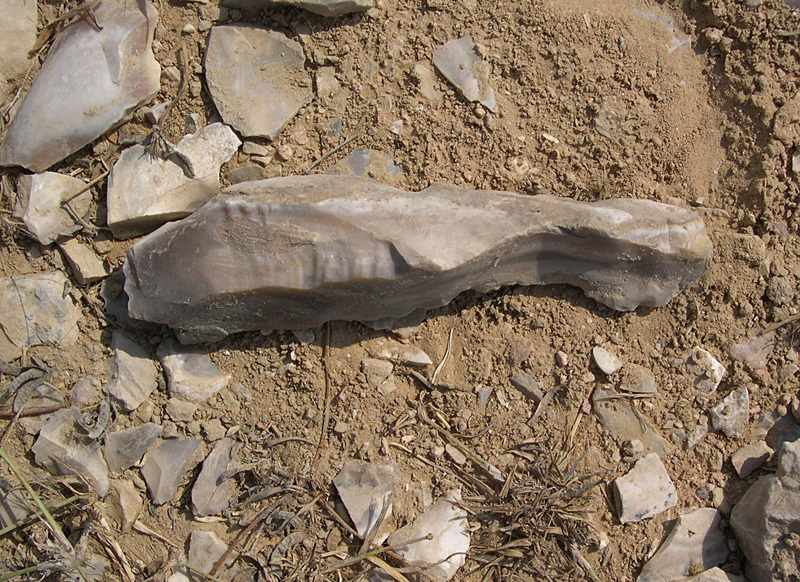 Above: Crested flint blade on the surface of JMP-21 mining area, Sindh, courtesy Antiquity.